Okay, I actually only thought the first immediately, but I don’t, and never have, understood the necessity of reading a book, once started, all the way through. Granted, there are books I had to start and restart that once I did read them, I was grateful. Confederacy of Dunces is my prime example. I’d been told it was funny, but until I was stuck at my mother-in-law’s with nothing else to read, I couldn’t get into it. I’m sure by abandoning books, especially books whose topic didn’t appeal to me at that moment, books that sagged too much in the middle, or books I misplaced, I missed some wonderful books. Possibly that last category is the one where this is most likely to be true. I have the unfortunate habit of losing a book at least once before I’ve finished it. 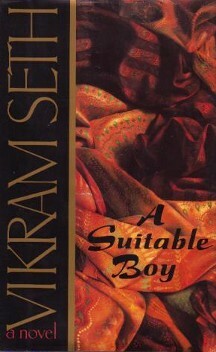 For me, the most notorious example of this is A Suitable Boy. I still can’t figure out how I’ve managed to lose a 1349 page book not once, but at least twice. At one point I even bought a second copy. I did eventually find the first book with the flap marking my place—page 111—but many years had passed; I didn’t think I could pick up the story there, and I didn’t want to start over. Someday I may finish this because for me, this one is like a relationship that never quite got off the ground. Lots of kisses and late night discussions but nothing more. Do you agree with the tweet above? Why do you soldier on with any book, and if you do, is it more often worth it or a waste of your time? This entry was posted on May 18, 2014, 9:12 pm and is filed under Reading. You can follow any responses to this entry through RSS 2.0. You can leave a response, or trackback from your own site. I didn’t used to quit on a book once I’d started reading. But I think that had more to do with my lack of sophistication as a reader; that is, I didn’t recognize when I was reading a lousy book. Now I have no problem dropping it if the book isn’t holding my attention. It’s the book’s job (which really means the writer’s) to keep me turning pages. There are too many other books calling for my attention to waste time on one that isn’t doing its job. The quote from the tweet is valid only if it’s a good book. I’m with BK: i used to trudge on, no matter what. I have no reasonable excuse for why, but it might be animism–imagining too vividly that books are sentient beings whose feelings might be hurt by my abandoning them. No more. I move on without guilt or concern. If it seems like a good book that I’m just not in the right mindset for, I keep it and try again, which I did, coincidentally, with Cloud Atlas. And I’m glad I did. Others, I donate or leave on park benches. Hopefully, someone will love them. I did almost add a bit about how I thought one of the few good deeds I ever did in life was to help a certain friend of mine realize she did not have to finish a book just because she started it. Now if only I could convince her it IS okay to break spines. Of books that is. Maybe not as justifiable with paperbacks, but in hardcover, it should be no problem. I would feel like a barbarian breaking a book spine.